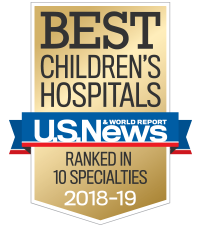 ATLANTA (June 26, 2018) – Children's Healthcare of Atlanta is ranked among the nation’s top pediatric hospitals for 2018-2019 by U.S. News & World Report’s Best Children’s Hospitals list. Children's had four specialties rank in the top 20. The Nephrology Program (No. 7), the Gastroenterology Program (No. 10), the Aflac Cancer Center (No. 11) and the Orthopaedics Program (No. 13) all ranked in the top 20 for their individual specialties. The report ranks hospitals for excellence in outcomes, program structure and national reputation in 10 pediatric specialty areas—with the survey questions created and refined by content experts in each field. Children’s ranked in each of the 10 specialty areas. The 2018 edition of “Best Children’s Hospitals” is published online at usnews.com/childrenshospitals and will be published in the U.S. News Best Hospitals 2018 guidebook, which will be available later this summer. “Best Children’s Hospitals” pulls together clinical and operational data from an extensive survey, completed by 189 hospitals. The not-for-profit organization has also been named among Fortune magazine’s list of the “100 Best Companies to Work For” for 13 years in a row. Visit choa.org for more information.